One reason why golf is so much harder than other stick-and-ball sports is that the ball is on the ground, not in the air, when you hit it. There really isn’t any room for error. If the club comes into the ball a half-inch too high or too low, that’s a mis-hit. Maybe it wouldn’t be noticed if you were off this much while hitting a tennis ball, but in golf a half inch is a lot. It is imperative, then, that you learn how to find where the ground is. Imagine this. I’ll bet you have done this more than once. You take a practice swing and miss the ground. You take another swing and miss the ground again. Now you know this is not the way to hit the ball, but you say to yourself, “That’s OK, I’ll get it right when I hit the ball.” And you mis-hit the ball. Why? Because you had no feel for where the ground is. You might say, “I know where the ground is, I can see it right there in front of me, I’m standing on it and I can feel it with my feet.” True. But when you swing a golf club, can you find the ground with the sole of your golf club? Hitting into the ground and raising up a big chunk of dirt doesn’t count. That’s finding one inch below the ground. You have to be able to nip the surface of the ground with your swing every time, or at least much more often than not, to play golf well. In 2006, I saw Paula Creamer at a golf tournament waiting to hit on the tee of a par-3 hole. She was taking loose practice swings, and she hit the ground in the same spot every time, and the hit made the same sound every time. That sound of her club thumping the ground was the key. The only way she could have made the same sound was for the club to be hitting the ground at the same depth. That’s knowing where the ground is. Practice this. Practice without a ball. Take easy swings and have the club brush the surface of the ground the same way every time as you swing through where a ball would be. This is Johnny Miller’s “brush-brush” drill. Practice this so you get the club down to the ground consistently and without having to consciously search for it with your hands as you come into the ball. Then, pay attention to where the club brushes the ground, because this is where you want the ball to be. Ball position is much more important than many recreational golfers realize. On the course, if you take a few practice swings, brushing the ground each time, put the ball in your stance about an inch behind where the brush was at its lowest point. That is the perfect spot for it. There’s a kind of golf you could be playing right now that is much better than the kind you are playing. It doesn’t require any improvement in your physical technique. Just by improving your mental approach to each shot, you will get the most out of the skills you have and shoot lower scores. When you stand behind the ball and look at where you want to hit it, you can think in one of two ways. You can be afraid of all the bad things that can happen–the mis-hits, the bunkers, the water, and all that. Or, you can think about the spot where you really want to hit the ball, and see it on its way and coming to rest right there, without those other things even entering your mind. I don’t have to tell you that the second thought is what you want your mind to be on. But how do you get your mind on that and only that? You have to practice. You practice your short irons over and over, for example, to get them target-ready on the golf course, so when you pull one out you know you have the skill to put the ball on the green. In the same way, you have to practice focusing your mind on the shot to come so that when you look at the shot you’re preparing to hit, you have the mental strength not to become distracted or disturbed by the places where the ball shouldn’t go. When you’re at the driving range with a bucket of 100 balls, warm up, and then take out one ball. Step behind it and look downrange. Pick a target. Do more than say, “I’ll aim for there.” Keep looking until you know, really know, that’s where the ball will go. Accept that believing the ball will go there and hitting the ball there are the same thing. To do the first is to do the second. Then hit the ball with that belief in mind. Prepare your mind that way before every ball you hit. Every ball. Not just when you remember to. You’re building up a mental habit, one that requires tremendous discipline. That will only happen if you promise yourself that you will practice this as much as you practice swing techniques. At first it might seem difficult, tiring, boring, maybe even pointless, because it doesn’t always work. You still hit a few clinkers. That’s OK. You’re creating a mind-body link that takes time to get established. Keep at it. With steady practice you will be both amazed and pleased at how well your shots start mirroring the mental belief that guided your swing. You will be similarly amazed at the deep concentration you can summon in an instant on the golf course. In the thirty seconds you have to prepare your shot and hit it, you will be drawing on tremendous mental strength. 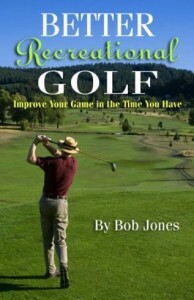 Your physical skills will come to the fore, and you will play the best golf you can play. 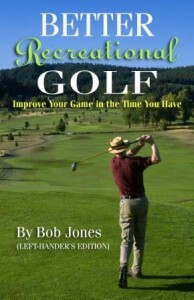 Recreational golfers shoot good scores by getting the ball in the fairway off the tee. By going through the following checklist before you swing, you will increase your chances of hitting good shots with the hardest club to hit well. Straighter shots begin when you set up to the ball. Most golfers set up aimed to the right of their target. Either the ball goes right, or a subconscious correction sends the ball pretty much anywhere, only sometimes where you intend. Practice your aim every time you go to the range. It is a skill that cannot be learned for good; it must be refreshed at every opportunity. Ball position counts, too. With your driver, you want hit the ball slightly on the upswing. Lay an alignment stick on the ground pointing from your stance toward the ball (at a right angle to your target line). When the stick points to the ball, and inside of your left heel lies against the stick, the ball is in the right place. The following traits can be easily built into anyone’s swing. They help keep the club under control so you can return it to the ball square and in line. 1. Grip down about a half inch from where you normally do. This will give you more control of the club. 1a. Slow down. I want to say this before you even step up to the ball. Slow down, make an easy swing at the ball. When you try to clobber it, your swing gets out of sequence and the clubface goes in funny directions. Don’t worry. Distance is built into the club. Think of chipping the ball off the tee, but with a full swing. 2. Take the club back straight. It’s hard to take the club back outside, but easy to take it back inside. Have a friend stand down the line behind you to give you feedback on getting this right. 3. Do not swing the club back too far. Take it back only as far as when you hit your 9-iron and see what happens. 4. Start your downswing by turning your body. Let the arms and hands go along for the ride until the momentum of the downswing, on its own, unleashes them into the ball. 5. Keep your body turning. A common error is to slow down your body turn near impact so can apply a hit. 6. There’s a race between your hands and the clubhead to get to the ball first, which your hands have to win. Keep pulling your hands through the impact zone. 7. Suppress the urge to clobber the ball with your right hand. Swing your arms and hands through the ball with your body turn. 2013 update: This summer I have been hitting my driver exceedingly straight. I attribute that to the work I have been doing on making sure my hands are ahead of the clubhead through the hitting area. Bonus: Until you can hit your driver straight, tee off with the longest club that you can hit straight. Should You Buy That New Driver? Every year, golf club manufacturers come out with new drivers, guaranteed to let you hit the ball longer and straighter. New technology and design trump last year’s up-to-the-minute advances. Now I assume that you’ve finally put that persimmon driver away, but at what point should you be willing to lay out $3-400 for a newer driver than the one you have, and if you want a new driver, should you have to pay that much for it? Let’s look first at the job a driver has to do. It is a club designed to hit the ball off the tee a long way down the fairway. Its bigger head and longer shaft mean that extra distance comes without any extra effort on your part. All you have to do is make sure your swing hits the ball straight, which, because of its relatively upright face, is harder to do with a driver than with any other club. So before you start looking for a new driver, ask yourself this question. Am I getting everything I need out of the driver I’m using right now? If the answer is yes, I’m getting satisfactory distance and I can put the ball in the fairway consistently, there might not be a reason to switch. If the answer is no, and you hit all your other clubs just fine, maybe all you need is a lesson to figure out what the problem is. If the answer is you don’t hit your other clubs much better either, then it’s the singer, not the song, and that $400 would be better spent on lessons. So it looks like in every case, you should stick with what you have rather than upgrade. Not quite. There are times you should switch. The new designs and technology do make a difference. Maybe not so much from one year to the next, but the improvements compound themselves. If your driver is five years old, advances since it was new could well let you hit significantly better shots, or the same shots more easily. How would you find out? Go try out some of the new ones under the supervision of your local pro or club fitter. Unless your current driver was fitted when you bought it, you might find that a new driver, fitted to your current swing, makes driving the ball a completely different experience. You use your driver 10-14 times every round, depending on it to get you into a position from where you can attack the hole. Ben Hogan regarded it as the most important club in his bag. Make sure the one in your bag is your driver, and delivers everything a modern driver should. You owe it to yourself. Even though everyone on the course is playing the same sport, with the same equipment, players of different skills are playing a different game. The object is to get the ball in the hole in the fewest strokes, but depending on your skill level, you’ll rely on different shots to do that. I’ve identified four skill levels common to recreational golfers and the shots that you need to be able to hit well in order to achieve that level. If you are brand new to the game, you need to just keep the ball in play and have an idea of what putting is all about (it’s not as easy as you think). So work on the 10-foot putt — learn to get it to the hole and not way beyond or way short — and a strong chip with a 6-iron. This shot is much like a greenside chip, but the club is taken back to hip height, the club shaft rising no higher than parallel to the ground, and your wrists stay firm throughout the stroke. You can acceptable play golf with this shot while you’re developing your swing. If you need to break 100, you’re hitting the ball reasonably well, but leaking strokes that you shouldn’t. It’s time to start tightening up your game. Practice sinking putts from 3 feet and under — you miss more of these than you think you do; the fairway-wood off the tee — do not try to hit it hard, just straight; and, a pitch to the green (from about 40 yards and in) that lands on the green and stays there. It doesn’t matter where the flag is, just get the ball on the green. If you need to break 90, you have too many three-putt greens. Practice 30-foot putts, because that’s three-putt territory; the greenside chip, because you’re leaving the ball too far away to get the ensuing putt in the hole. You also have a swing flaw that sends the ball off line too often. Get lessons and get that flaw corrected. You’re stuck where you are unless you do. If you need to break 80, practice the 5-foot putt — missing these can be the difference between 79 and 81; irons that reach the green because you can hit them straight, and you know, really know, how far you hit them; the driver, which you will use to hit fairways at distance — it’s time to start taking your game to the course instead of the course handing you your hat. 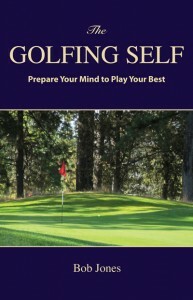 In almost every mental game book, you are told that having a swing thought can focus your mind on swinging the club the right way, and help keep out intrusive thoughts that would otherwise disrupt your swing. Using a swing thought while you’re swinging at the ball is the fundamental mistake of the mental game. This is none other than allowing the conscious mind to intrude into a process that it should stay out of. Most of what we do in life is automatic. We do not need conscious thought to eat a bowl of cereal, for example. We have done that so many times that we no longer have to pay careful attention to getting cereal in the spoon, and not spilling it while we bring the spoon up to our mouth. In the same way, if we have a well-schooled golf swing, we don’t have to keep reminding ourselves how to swing. A concert pianist spends no time thinking about where the fingers should go. To think about this during a performance would likely bring it to a frustrating halt. When you’re over the ball, swing thoughts make you concentrate on just one part of your swing, to the detriment of all the rest. It’s best to avoid them altogether. I have to admit, though, that a swing thought can work in the very short term. Have you ever been on the range and had a hot swing idea pop into your head, started doing it, and hit three or four great shots in a row, and then, back to normal? The magic can fade that fast. And then what do you do? When you are swing thought oriented, golf becomes a continual search for the magic thought that will help you do what you can do quite well if you would just leave things alone. Again, swing thoughts insert the conscious mind into a process where it doesn’t belong. If you can play golf with a calm mind, and make swinging the club as simple as eating your cereal, you don’t need any more help. You don’t have to remind your body how to hit this shot. It already knows what to do. The U. S. Open starts tomorrow. It’s my favorite golf tournament of the year. In fact, I have told my family that I am available for them 364 days of the year, but for that one day, the one which they play the fourth round of the U.S. Open, I’m not there. It’s my day to spend watching the greatest golf tournament on earth. This year it’s back at the Congressional Country Club in Washington, D.C. , where Ken Venturi won in 1964 while almost having to be hospitalized for heat stroke. I remember watching on TV and wondering how on earth he was even staying upright, much less playing golf. This year, the weather should be rather pleasant. The temperature forecast is for the mid-80s the entire week, though rain is possible on Thursday, and thunderstorms are possible on Friday. Did you know that the Congressional CC grounds were taken over by the OSS during WWII to train teams of spies, saboteurs, commandos, and undercover agents? And that the fee paid to the course owners for the favor probably saved the course, which was in financial trouble at the time? The USGA likes to play with its first- and second-round pairings. Part of the fun is trying to decode what the threesomes have in common. This year, Edoardo Molinari, Francesco Molinari, and Matteo Manasero are playing together on Thursday and Friday. Get it? Another group is composed of Brian Gay, Thomas Levet, and Gregory Harvet. For those of you who aren’t students of the French language, all those last names rhyme. These might be a little harder. Charl Schwartzel, Trevor Immelman, Zach Johnson. Luke Donald, Lee Westwood, Martin Kaymer. Phil Mickelson, Rory McIlroy, Dustin Johnson. Give up? In order, former Masters winners, the top three in the current World Golf Ranking, and three players who have blown a commanding major tournament lead. The traditional pairing is Graeme McDowell, Louis Oosthuizen, and Peter Uhlein this year. The USGA always pairs the reigning U.S. Open, British Open, and U.S.Amateur champions the first two days. The opening shots will be hit by this year’s dew-sweepers, Daehyun Kim, Chez Reavie, and Shane Lowry on #1, and Chad Campbell, Harrison Frazar, and Marc Turnesa on #10. I know all the players love the Masters because of the gifts everybody gets and the lifelong adulation accorded past winners, but it really isn’t a major tournamant. It’s just an over-hyped invitational. The British Open is historical and the most cosmopolitan tournament, the dean of the majors. The PGA is a major because it is the championship of a major governing body, but it doesn’t have the same sense of a major, really. It’s the U.S. Open title that carries the most respect. It’s the one that deep down, players want to win the most. It’s the one I won’t miss. So who’s my pick to win? I’ll go with Alvaro Quiros. This is a long course, and he’s silly long, and straight. His short game is up to snuff, too. He has already won this year, and I think he is a force whose time will come. Maybe this week. If your boyfriend plays it, if your husband plays it, if your girlfriends play it, or if it’s just something that you want to try, welcome! Golf is a lifetime game that gets you out into beautiful surroundings having fun with friends. There’s quite a bit to learn, but if you take it in small steps, it will always be enjoyable. The absolute first thing to do is sign up for some lessons. Hitting the ball is not as easy as it looks, and you need someone to teach you how. Please, if your boyfriend or husband wants to teach you, politely decline, and get lessons from a PGA professional who knows how to teach someone who is just starting out. A series of five lessons should get you started on the golf swing, putting, and little shots around the green that have their own special ways of being hit. You don’t even need clubs to take lessons. The pro shop will have some you can use while you’re there. When it’s time start playing, though, you’ll want to buy some clubs. Make sure you buy ones designed for women. They have a different weight and balance than men’s clubs do, and will be much easier to swing. Make sure you get a fitting when you buy your clubs so they are tailored personally to you. Speaking of buying, here is what else you’ll need to start playing. You’ll need a golf bag to put your clubs in, a wheeled cart to strap the bag to so you don’t have to carry it (it can get heavy), golf balls, of course (ask your pro which ones would be best for you), and golf tees to put the ball on when you hit it. A towel clipped on to your bag is a must for cleaning the face of the club after you hit the ball, and for cleaning your ball once you get it on the green. You’ll need a marker to mark your ball on the green, but a coin in your pocket will do. Be sure to wear clothing that is comfortable. Golf clothing has its own styles and wearing them makes you feel more a part of the game. Golfing fashions are not just for the golf course these days. The updated golf fabric cuts and structures cross the fashion boundaries into other sports and street wear. You can feel comfortable playing 18 holes of golf, a quick meal in the clubhouse and out on errands without a change of clothes. New fabric materials and layers allows for adjusting temperatures. Carry a rain jacket, though, in case it rains unexpectedly, and bring an umbrella if rain is possible. Golf shoes are not a necessity, but they have special soles that grip the ground so you won’t slip when you swing. If you are serious about playing, invest in a pair. Until you do, wear shoes that are sturdy and comfortable for long periods of walking up and down hills. Being able to hit the ball is only half of what a player needs to know. There are principles of golf etiquette that you must learn to become a welcomed playing partner. They mainly involve ways of keeping pace with the flow of play of the other golfers on the course, and of not creating disturbances for the golfers you are playing with. The best way to learn them is to have a playing lesson from your professional, where you go out on the course to see how to apply the shot-making skills you learned, and to find out in practice what the principles of golf etiquette are and why golfers observe them. I recommend two procedures for all beginning golfers, not just women. First, tee up the ball whenever you hit it from the tee or the fairway. The rules say only from the tee, but hitting the ball off the ground is hard to do at first. Tee it up (without taking too much time about it) while you’re learning the swing to make it easier on yourself. Around the green, where you use little part swings, you can play the ball off the ground. Second, if you’ve hit the ball five times and you’re still not on the green, pick up your ball and walk it up to the green. This helps maintain the pace of play. Experienced golfers won’t mind that you’re learning and don’t hit great shots all the time, but they will mind if you’re slowing down the group. Also, you need to be aware of players in the groups behind you who will be expecting your group to finish the hole in a timely fashion. Most golf courses, public and private, have a women’s league you can join to play with more experienced golfers who will help you get started playing this wonderful game. Last February, I posted some advice on playing from the right set of tees based on how far you normally hit your drive. If you hit your drive 225 yards, then around 5,600 yards is the right set of tees for you. That calculation is based on the average driving distance of touring professionals and the length of courses they play. See that post for the details. Now the United States Golf Association and the PGA of America has gotten into the act, and is singing the same song. They recently started a “Tee It Forward” campaign to urge golfers to play from the tees that reflect their ability, not their ego. Those are actually the mid-points of suggested ranges. Their formula is somewhat inconsistent, but if you do the math you’ll see that the CY to DD ratio at DD=300 is 24.3. It climbs to 26.5 at DD=200, then descends again to 22.0 at DD=150. About the time I made my earlier post, I talked to the supervisor of the men’s club where I play and pointed out that our weekly competitions are played from a set of 6,400-yard tees, and a set of 5,900-yard tees is available. There are a few, but not many, guys in the club who routinely hit it 250 off the tee. There are a lot of them who come in reliably at 225. Maybe I’ll suggest this to him again, because the Establishment has taken up the cause and it’s not just some guy with a calculator and too much time on his hands. Sure, the bombers would shoot better scores, but they always shoot better scores than the rest of us right now. Maybe we could have two flights – a white tee flight and a gold tee flight. There’s a set of red tees at 5,100 yards, and some of the guys should really be playing from those, but I won’t go that far. So again, I say make an honest assessment of your skills, and play from the right set of tees. You’ll get more pars, play faster, and have more fun. “I was pleased to see the Tee It Forward notice [In the News, June 3]. I blogged earlier this year on the same idea. Touring pros would howl if they had to play an 8,000-yard course every week, but that is what many amateurs do, relatively, by choosing a set of tees that is too long. The way our bodies are put together, combined with the angles of the golf swing (not flat, like baseball), almost makes a slice the natural stroke to hit. No wonder so many golfers slice. It’s so easy to do. You could cure your slice by learning to swing differently. It’s not hard to do, but it does take work, and who has time for that? Or, you could buy the right golf ball. Like the New Polara golf ball. This ball is made with a dimple pattern that minimizes spin. If you align the pattern the right way when you tee it up, the simple physics built into the surface of the ball helps it go much straighter. Actually, this ball is not new. It first came out in 1977, but was banned by the USGA in 1981 and the ball disappeared. Last year the ball came on the market again. Just two things you might need to know about it. First, the ball is illegal for any round where the rules matter, such as tournaments or establishing a handicap. Second, you get the low-spin advantage only on the tee, since that’s the only time you can guarantee the dimple pattern will be aligned. But if you’re going to use this ball, you don’t care too much about the rules, so go ahead and line it up whenever you want to. Just don’t tell anyone I said it’s OK. Some golfers want to know if there is a golf ball that won’t slice, but will still spin around the green. This would be the best of all worlds. Unfortunately, no. We live in a world of trade-offs. Get a little more of this, and you have to give up a little of that. Nature requires a balance. You can use a ball that minimizes spin (legally) but as it won’t spin so much off your driver, but neither will it spin so much off your wedge. The opposite is true, of course, If you want a ball that dances a jig on the green, it’s going to exaggerate any spin you put on it from the tee or the fairway. For higher-handicpap golfers, I would recommend getting a low-spin ball. Keeping the ball in play from tee to green is the best way to keep your score down as you learn to control the ball off your swing. Once you begin to break 90 regularly, you should switch to a spin ball, sometimes called a Tour ball, as your swing improves and you learn to get a more refined short game. Play a round with a Polara just for fun, but if you’re serious about developing your skills, get a ball that rewards what you have learned to do.